I just stumbled upon some most alarming information. It seems New York City Transit has started placing ads right on top of subway cars windows. I immediately fired off a letter of complaint to the MTA, which explains why I believe these ads are a very bad idea. You can read my letter below. 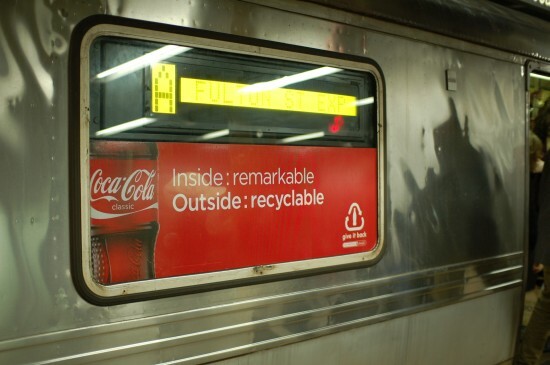 I was at the 14 St – 8 Av station this evening when I saw an (A) train come in with Coca-Cola ads covering the windows of approximately every other car of the train. I was quite appalled by this. I didn’t get on the train, but I assume that these ads are similar the wraps that cover the windows of buses. That is, they have tiny holes in the ad that supposedly make it so that people inside the vehicle can still see out. Well I dislike those wraps immensely, as outward visibility is significantly reduced in outdoor lighting, and severely reduced to totally eliminated at night or in low lighting. The point of windows are to look through (both in and out), not to cover. I recognize that there is value in covering the windows with ads – you get advertising revenue. However, I believe that there are better reasons NOT to cover the windows with ads, and thus you should instead try to earn the advertising revenue with ads on other (non-transparent) parts of the cars. Advertising can and should be placed on the car body, and not on the windows. I ask that you reconsider the decision to cover them. People look out the window for many reasons, including to sight-see, to see what station they are at, and just to pass the time. They should not have to have their visibility compromised because of advertising. And people all the time look in to the cars, through the windows, to see how crowded the cars are. If they see a crowded car, they know to move down to another door or another car. If they can’t see that until the doors open because the windows are covered, then there will be additional boarding delays. Furthermore, having the windows covered prevents people outside the cars from seeing in (I could not see in to the car), and that could be a security risk. Again, I do not like these ads covering the windows, and I doubt many people will like them. Please consider removing them immediately and replacing them with ads on the metal car bodies. The exterior “stripe” ads (History Channel and Monroe College) on the cars on the (1) and (3) lines are quite harmless and an excellent idea. Something similar to that could possibly replace the window ads on the (A) train cars. 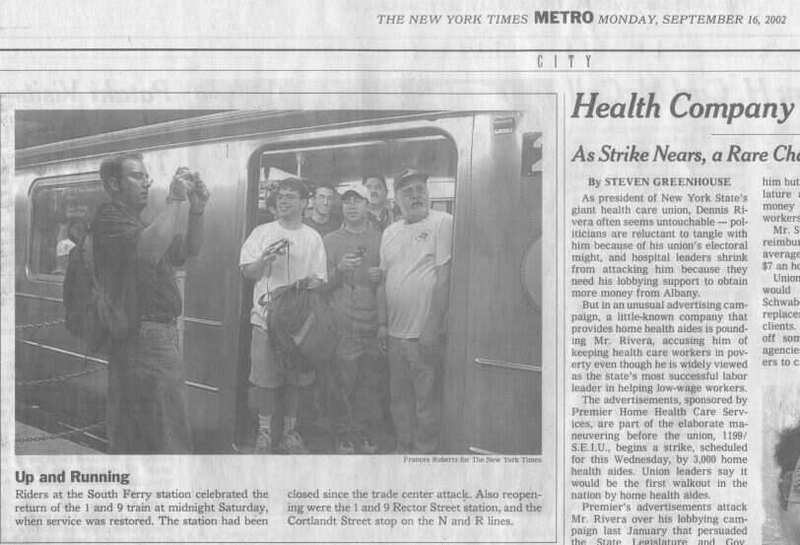 ‘Train Dude’, an NYCT supervisor at one of the yards these trains are stored and maintained, posted on an online forum that the NYPD approved these ads – in other words, they don’t think there is any security risk from not being able to see into the cars. Here are two more photos I took showing exactly what is going on with these ads, which are for Coca-Cola. Update #1: The MTA sends me a ridiculous response to my complaint email. Update #2: After I write to the MTA again, they agree to forward my complaint to the Department of Subways.